The Washington Brewers Guild invites you to join them for the annual Cask Beer Festival on Saturday, March 24th at Seattle Center. Tickets are now on sale. Commonly referred to as Cask Fest, this gathering of breweries, beers and beer lovers is one of Seattle’s most popular beer events of the year, featuring over 100 cask-conditioned beers from 37 Washington breweries. There are two sessions, one in the afternoon and one in the evening, with separate tickets required for each. The afternoon session is particularly popular and usually sells out in advance. The $40 cost of admission (advance) includes a commemorative tasting cup and 15 four-ounce tasters. 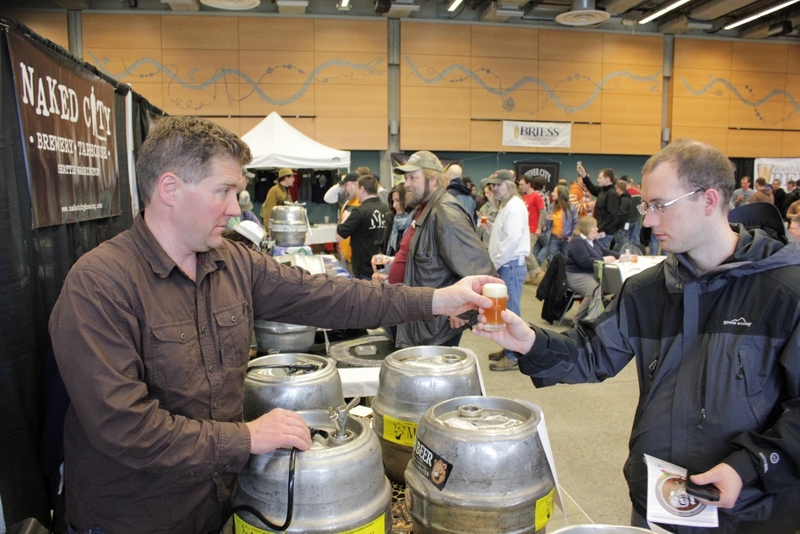 Cask Fest was born over a decade ago when a group of Washington brewers convened to introduce cask-conditioned beer to local beer consumers. What makes cask-conditioned beer different than regular beer? We recently released a podcast about this topic on the Washington Beer Pod. Real ale, as it is called in England, is carbonated naturally, using a process called secondary fermentation. Regular beer is fermented to completion and then transferred to a large tank (brite tank) where CO2 is extraneously added to the beer before it is transferred to kegs or other serving vessels (bottles or cans). When producing cask-conditioned beer, the brewer carbonates the beer naturally, in the vessel from which it is served. The beer never goes into a brite tank. The CO2 is created by secondary fermentation. A wee-little bit of final fermentation happens in the keg or the bottle. CO2 is a natural byproduct of fermentation. (The bottled version is known as bottle conditioned.) This type of carbonation is a bit more still. Not as fizzy. It is often described as smother and softer on the palate. Cask-conditioned beer is typically served at cellar temperature (roughly 50 – 55 degrees) and not at refrigerated temperature. 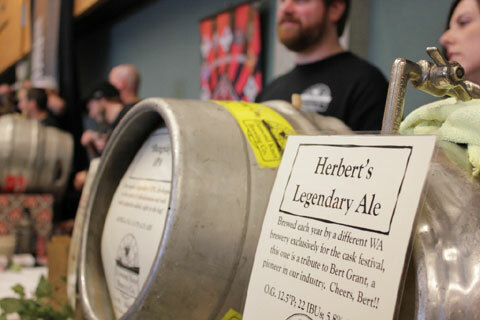 Along with a lot of other great beer, Cask Fest feature the annual, limited release of Herbert’s Legendary Cask Festival Ale, a special collaboration beer brewed in honor of the late Bert Grant, a legendary Washington beer brewing icon. Each year a different host brewery invites fellow Washington brewers to brew the beer based on the recipe that has been passed on from one host brewery to the next. This year’s Herbert’s Ale was brewed at Mac & Jack’s Brewery in Redmond. Here are event details. Below that, the list of Washington breweries participating in this year’s Washington Cask Beer Festival. $40 advance tickets or $45 at the door. Admission includes a commemorative tasting cup and 15 four ounce sample tastes. Must be 21 years old or older and have a valid ID to be admitted. Designated driver admission is $5 and includes free soda and water. Tickets are on sale online at washingtonbrewersguild.org.